Want to purchase an authentic Italian leather bag or accessory from OldAngler? Here you'll find all the information you need to complete your order. Prices are expressed in Euro, US Dollars, Austrailian Dollars, British Pounds and Japanese Yen, according to the country specified. For all other currencies, we suggest you use Xe.com Currency Converter to convert any monatery amount into your currency. Conversions are approximate and based on current exchange rates. Every transaction is processed in Euro, and converted based on an approximate exchange rate and merely indicative. The total amount of your transaction in Euro will always be shown at the end of the purchase during check out. The actual transaction total in your currency is based on the exchange rate applied by your credit card company once the transaction has been approved. 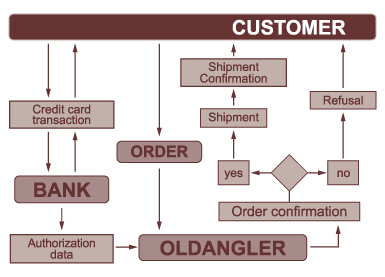 Old Angler processes each transaction once the product has been shipped to its recipient. All products in our online catalogue are available for quick delivery, in the instance a product is not immediately available you will be notified via email as soon as possible. You will receive your purchase with 7 days of shipping (times may vary depending on the destination country). Shipping is free throughout Europe for all purchases over €100.00 (£100.00)—VAT excluded. Shipping type may vary based on the destination country: generally we trust all our deliveries to TNT (USA and Canada), DPD (European Union) and Express Mail Service (all other countries). Other shipping companies may be used if considered more convenient. Most purchases arrive within 7 days of shipping (depending on the destination country). The prices in the online catalogue include VAT (22%) if required by the destination country. Duty taxes are not included in the final total and are the responsibility of the customer. Please note that VAT is calculated during check out and is included only if the destination country indicated on the shipping address requires it. European Union - VAT - 22% / no duties. USA and Canada - approx. 35-40 USD. All other countries - please inquire at your local customs office before submitting your order. You can cancel your purchase without charge any time before you receive the shipping confirmation: afterwards the order cannot be cancelled as the products have already been shipped. If you are unhappy with your purchase, you have 10 days after receiving the product to return it (without using it) for a refund. Please note that all personalized or monogrammed items are not refundable. Place the merchandise in the original shipping box or in an appropriate sized shipping box that will properly protect the leather. Include the original receipt and indicate the reason for which you are returning the merchandise (wrong article, damaged, etc.). 50065 Pelago (FI) - Italy. Old Angler will issue a refund within 48 hours of receiving the returned merchandise. Shipping and postage fees are not included in the refund and are at the expense of the customer. Refunds will be issued on the credit card used to purchase the merchandise or mailed directly to you in the form of a check or money order within 7 days. The contract of sale that Old Angler follows is regulated by Italian law; and in the case of an International sales contract is defined under Art. 1 of the Vienna Convention of 1980 on the sale of goods, when not otherwise excluded or derogated from by these conditions or by the parties in writing. Any and all disputes arising from the sale of Old Angler's products shall be resolved by the Florentine court. Old Angler reserves the right, however, to take legal action in jurisdictions where the counterparty is concerned. Please contact us for any claims, you will receive a reply as soon as possible. For any suggestions or comments on how Old Angler can improve its service to meet the needs of customers, please write to info@oldangler.com. Your feedback is most appreciated. All leather products come with a 2 year guarantee during which time any and all product malfunctions or defects will be repaired free of charge. Instead, all defects resulting from improper use or care of the article are at the expense of the customer. Please note that shipping expenses to and from Pontassieve are the responsibility of the customer. You can safely pay with your credit card through Stripe payments Platform, Old Angler guarantees payment reliability and privacy. We accept American Express, Visa, MasterCard, Discover, JCB, Switch \ Master, Solo. If you select PayPal as a payment method during checkout, you will be taken to a Paypal login page where you can access your account and complete your purchase. If you select a Bank Transfer Payment, the checkout page will provide you the details to proceed with your order. In this case, we kindly ask you to write us an email at info@oldangler.com, when the payment is done. DOC 47 - Web Conditions of Sale rev.07 of 2013, October 15th.